A little background first. My grandfather was a B-24 pilot in WW2 in the 854th bombing squadron in the 491st bombing group. He flew 35 missions, 30 as lead pilot and, having completed his missions and won a DFC, came home to St. Louis at the end of the war. The war ended just as he was about to do training to eventually be sent to the Pacific theater. 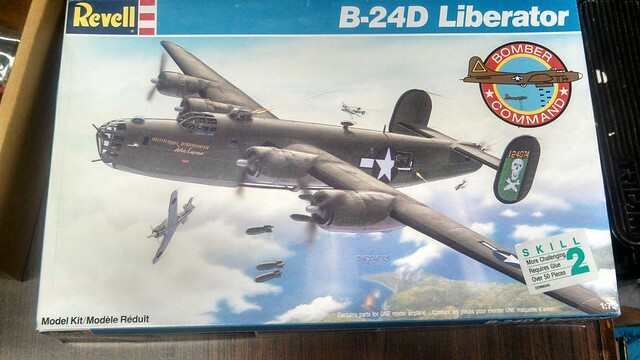 My grandfather passed away a couple years ago, but when I was a kid, I made him a model of a B-24 (It wasn't this kit, but it was pretty close). I also wound up making a family and friends documentary about his time in the service. So after all of this, I've got a deep interest in B-24s. After getting back into model building early this year, I decided to do a B-24. Thus, this was actually one of my first additions to the stash. I've learned some stuff since then, however. First off, this is not a particularly good kit. Second of all, my grandpa flew the B-24J. 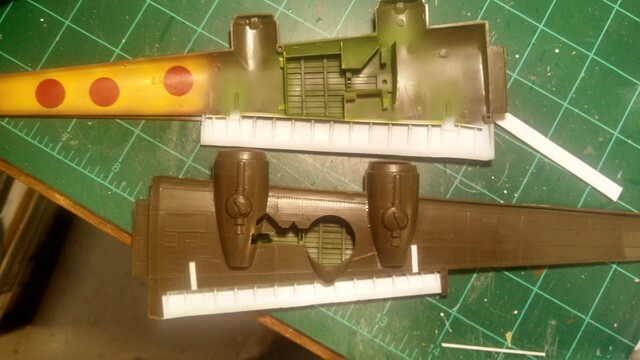 So I wound up getting the Hasegawa B-24J kit with about $200 of extras off of eBay for $70 shipped. 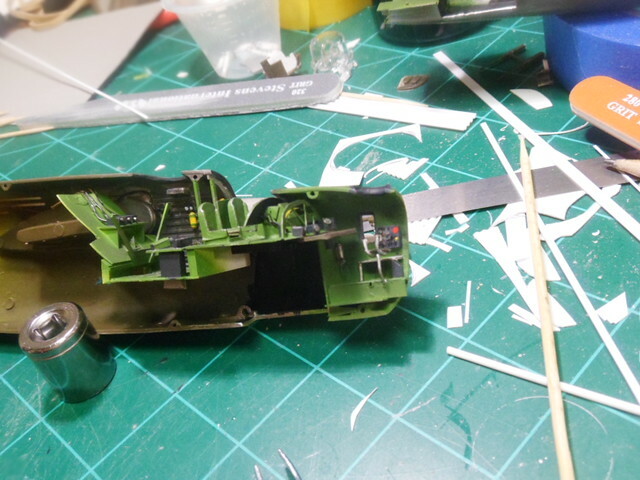 I'll be doing a WIP on that later - I still need to improve my skills before I tackle that job and I have a bit more research to do (I'm trying to determine the actual details of a plane he actually flew). So I've decided in the meantime to do this guy. 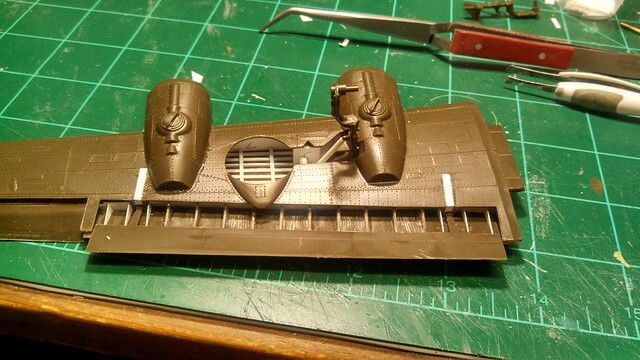 This model is built very much as a toy - essentially all of the control surfaces are movable. 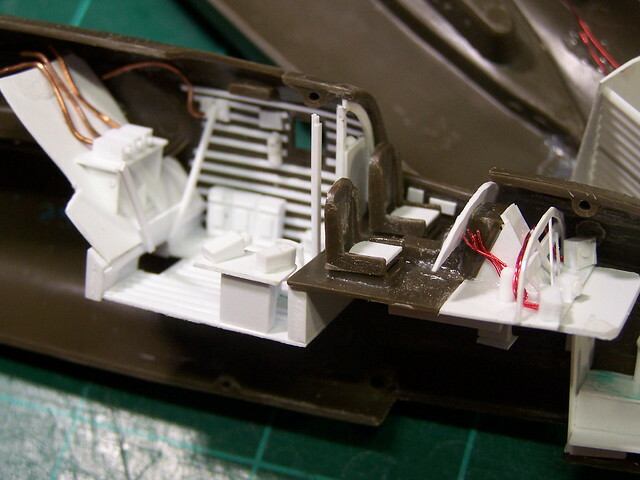 And there is almost no interior detail. 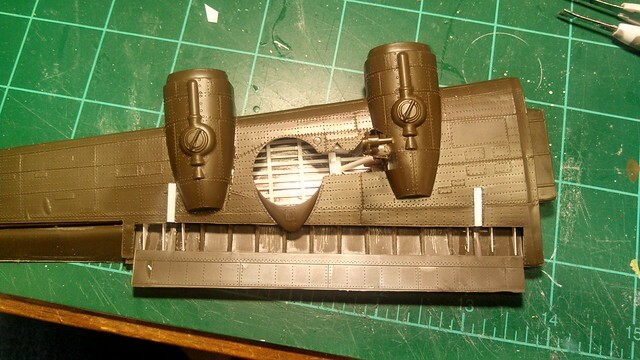 And the rivets. Oh, the rivets... 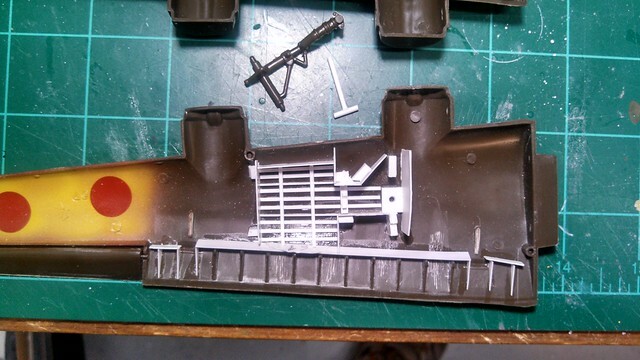 I've decided not to worry about the rivets. 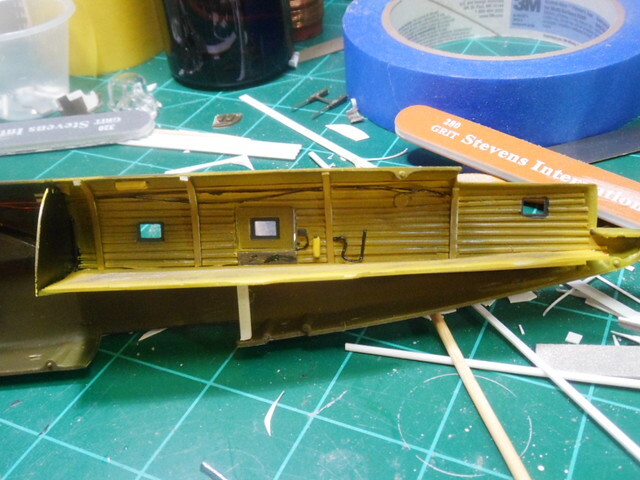 The interior detail I'll be doing a lot of scratch building on. I've decided to do this one up as The Little Gramper. This was actually the assembly ship that my grandfathers group assembled on. It was a war-weary B-24D that was painted yellow with red polka dots to be easy to see from a distance so the pilots could easily form up on it. Therefore, I don't need very many of the weapons since most of them were removed. Also, with the garishly bright paint scheme, I suspect (hope?) that the rivets won't be so pronounced. 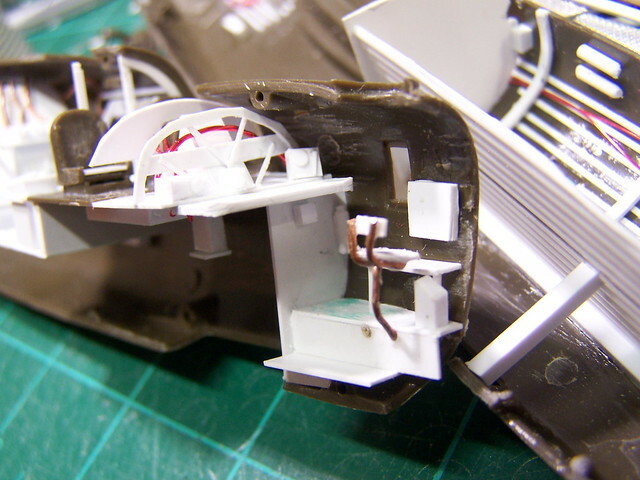 I've started with the wings - the gear area is completely void of detail and the flap area allows you to see the entire smooth surface of the inside of the wing. This needs help. 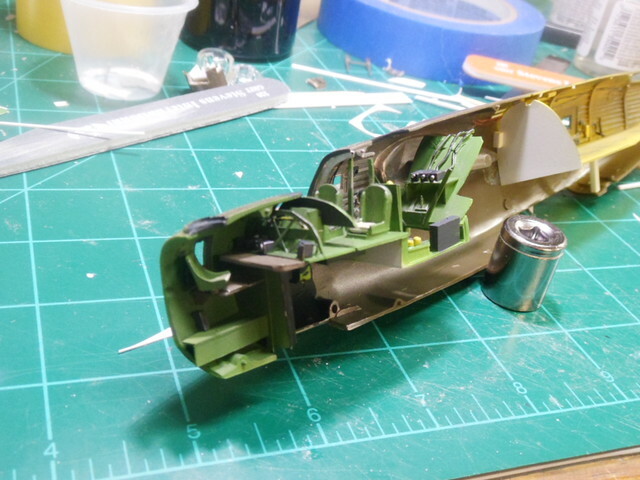 I have created a wing box and added detail which, while not 100% accurate, isn't crazy far off and will create a fair amount of visual detail inside there. That's all I've done for now. 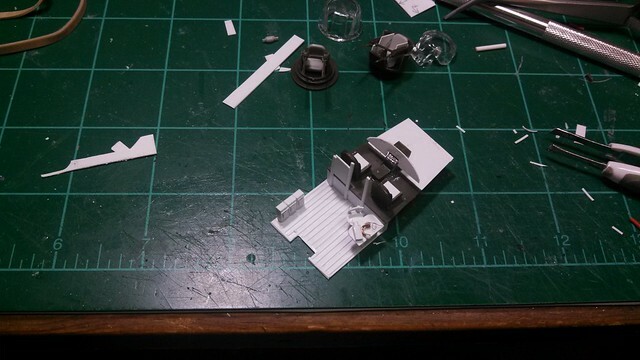 I did actually cut out each of the styrene pieces twice so I should be able to do the other side relatively easily. Anyway, I'm really looking forward to this - I like the scratch building parts and this seems like it's got a lot of opportunities for me to work on that skill. Any suggestions or ideas would be appreciated. Just a quick update - I detailed the gear well of the other wing and painted them up a bit. I think the extra detail really does the job of adding some interest and making it look good. I might need to dirty it up a bit more, though. 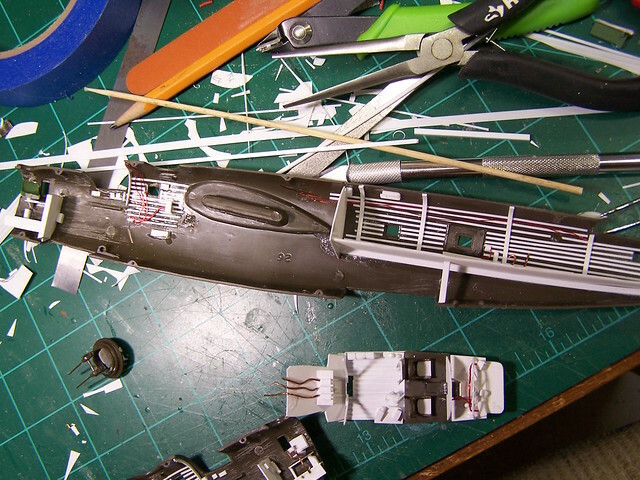 I think I'll be getting ready to glue the wing soon - I'll probably have a bit more painting and then masking to do before I'm able to put them together. Also, my references say that the gear well was Zinc Chromate, but some photos (in Black and White) seem to look like they might have been painted white. Anyone know for sure or is this one of those - some places did it one way some another things? Helluva fine job on the wells, looking forward to following this one! Looking good and think you idea how the gear retracts is great. I've made a bit of progress on the wings, but don't have any photos right now of it. 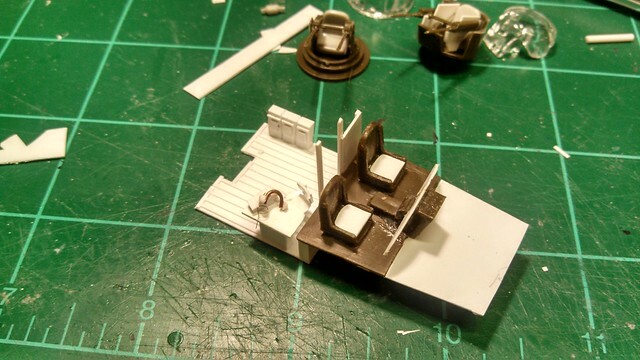 I've also started putting together the interior. 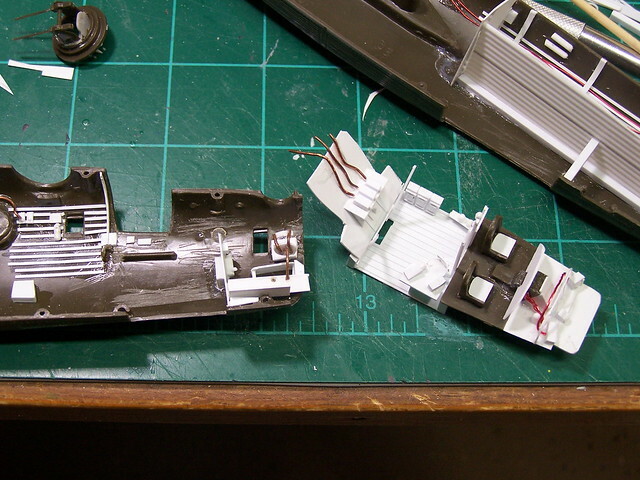 The actual kit is almost completely devoid of detail, so I'm pretty much scratch building the entire interior. While a lot of this won't be seen well, I want to have enough detail to hint at things and I'm having fun, so who really cares if all of it will be seen. I am going to add the oxygen bottles and fire extinguishers since those are about the only bright colors in the interior and should be visible to some extent through the windows. I may also add a few more details in the back, but it's close to done. Next, I'll need to do the navigator and nose area. Again, the kit provides nothing. 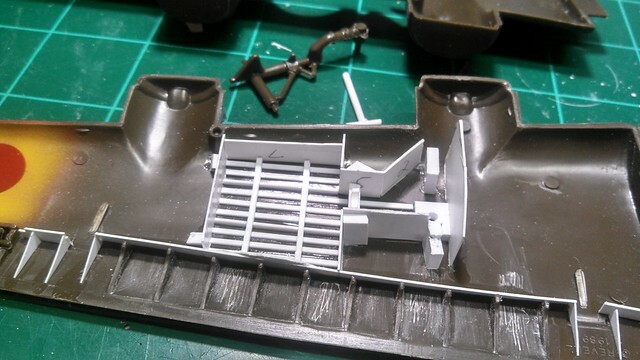 I've also done just a bit of work on the turrets (I stole the seats from an incomplete old kit I had lying around). While the guns were not manned on these kinds of missions, I want to have enough detail for them to look reasonably correct. Since I'm doing this taking off, it needs a crew and I figure I probably need pilot, co-pilot, radio operator and navigator for the crew. Does anyone here actually know how many people would have been flying these kinds of missions? The only detail I really added was some oxygen bottles, texture for the walls and the relief tube. 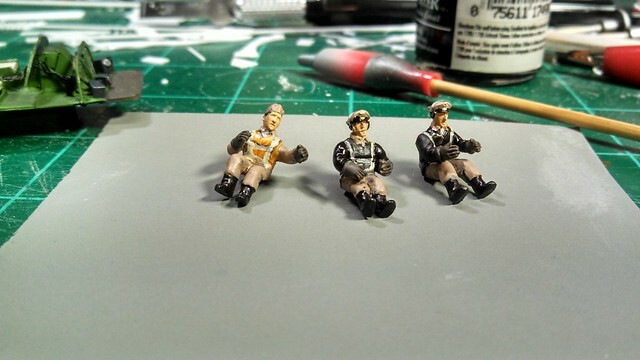 To finish the interior, I need to add the crew members and finish the turrets. 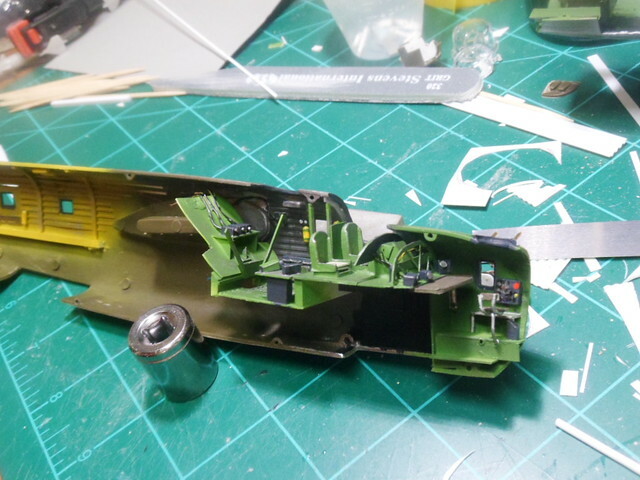 Once that's done, I'll add the windows and get back to the wings. 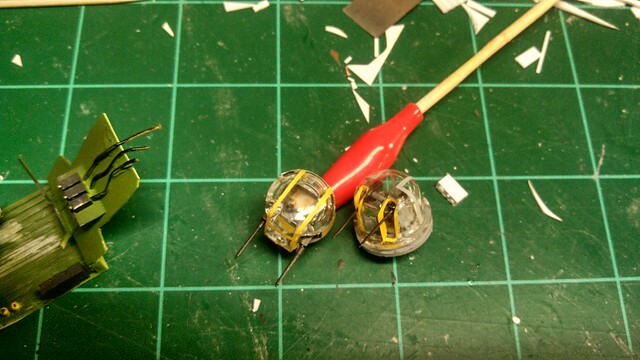 I also carefully painted the turrets, adding masking tape seat belts. 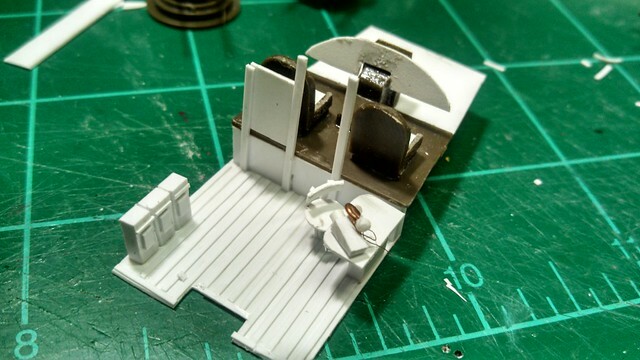 Loving this build and all the incredible scratch built detail you're doing. Keep up the great work! but....whow.....what a job at this scale !!! love your scratchbuild job !! Thanks! I'm having a lot of fun. Thanks Pat, your attention to detail is one of the things I find inspiring. I also tried using an Eduard paint mask for the first time with this model. For the wheels, it worked spectacularly. I mean WOW! For the canopy and front glass, it really worked very poorly. It's possible that the one I got was old (I got it second hand) or something, but as soon as I started painting, the masked areas started to come up a bit around the edges. I wound up painting it mostly by hand. It looks okay, but unfortunately, it's not as good as I was hoping. Ah well. I've also realized that through those clear areas, your not going to be able to see a whole lot of detail, so I'm glad I've been documenting here. Otherwise, no one will ever see some of that stuff. Of course, it's all been great practice and I've had quite a bit of fun. 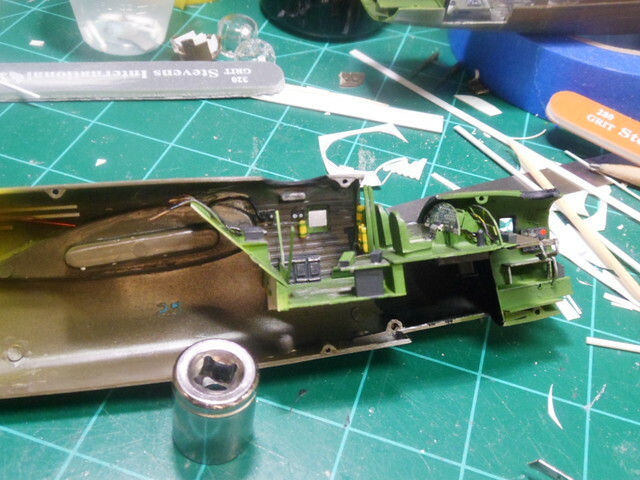 I expect I'll be getting to start putting the fuse and wings together in the next couple days. I've also built the support structure in the fuselage so that I can have this thing just after takeoff with the gear partway up. 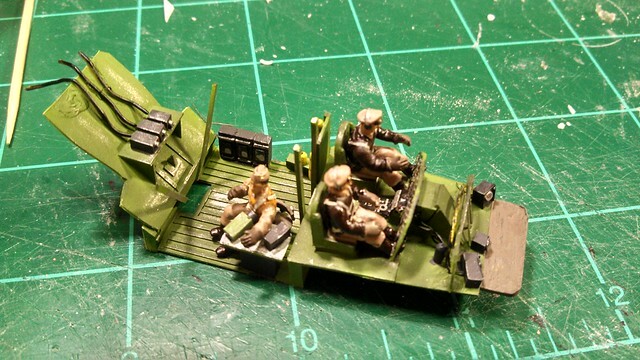 I'm trying to get this done for the Chattanooga Model Con, so I've only got a week and a half.